Incredibles 2 picks up directly where the first movie ended, with the Parr family suiting up to take down the Underminer. But with superheroes still outlawed, their interference isn’t met with thanks, until they meet business tycoon Winston Deavor, and his sister Evelyn, who wants to bring superheroes back to prominence. Returning writer and director Brad Bird has formed a brilliant follow-up that takes the characters in new and interesting directions. He had previously stated that he would not create a sequel if it wasn’t as good as the original, and while this is a fantastic movie, this doesn’t quite reach the bar set by the original. Getting the biggest chunk of the action this time around is Helen Parr/Elastigirl, voiced by the excellent Holly Hunter. Armed with a new suit and motorbike, she gets to go out and save the world and manages to hold her own in a movie with so many other primary characters. She’s written perfectly and feels realistic, making her the best Pixar/Disney mother of recent years. Craig T. Nelson returns as Bob/Mr. Incredible, who has to stay at home with the kids, after he’s deemed too destructive for helping people. He’s written brilliantly again and his interaction with the rest of the family feels real as he tries to stop becoming overwhelmed by the kids and be the best father he can. Completing the family are the kids, Violet, Dash and Jack-Jack. Violet is given a great story involving the pressures of balancing the superhero life with that of a teenager, while Dash is mostly side-lined to a comedic character. But with a film full of fleshed out characters and a deep story, one person was bound to draw the short straw. The real scene stealer of the film is baby Jack-Jack, who, as we saw at the end of the first film, does have superpowers of his own, plenty of them. If you’ve seen the brilliant short, Jack-Jack Attack, you will have an idea of some of his powers, but there’s more surprises in store. This film explores what he can do to great effect, with Robert trying to figure out how to look after him and control his emerging powers. While the Incredibles are doing their thing, we are introduced to the movies antagonist, the Screenslaver, who is able to control people through mesmerising lights on various screens and displays. Screenslaver isn’t quite on the same level as Syndrome, but the character is written very well with their motivations becoming clearer as the film progresses. It’s established as a mystery surrounding the Screenslaver’s identity, but unfortunately the reveal is easy to see coming. There’s plenty of other characters and superheroes throughout, with both returning characters Lucius Best/Frozone (Samuel L Jackson) and Edna Mode (Brad Bird) getting some great scenes. Frozone is given much more to do this time around and some really impressive action scenes, while Edna only has a few appearances, but it’s great to see her back again. The story is very different to what we have previously seen in most superhero films, which is a difficult thing to do in a highly populated market. It has several plot points, with Helen and Bob’s stories at the forefront, while each character is dealing with their own situations. The films balances everything really well, but certain moments feel glossed over to make way for the bigger stuff. The action in this movie is amazing and rivals many of the live action movies for tension and drama. It feels real with human characters in the middle of it all. It feels tailored towards Elastigirl, with a runaway monorail and a dramatic air sequence. Each of those scene are expertly handled and allow each character to show off their powers in believable ways. 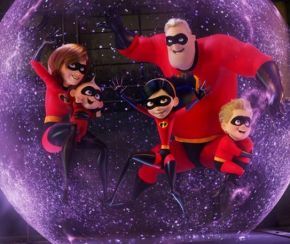 It’s an impressive feat for Pixar to keep upping the quality of animation in each of their films and shorts, and Incredibles 2 is no exception. The technology has advanced tenfold since the original came out, allowing the cotton on the character’s t-shirts to be visible, the hairs on their heads move realistically, the props and food almost look real. The use of lighting is absolutely stunning, with realistic looking environments being high in detail. The shadows work well and almost evoke a thriller in certain scenes, such as Elastigirl's infiltration of an abandoned apartment. It’s also a nice added touch that Pixar gives to each movie with each character having subtle movements that most animators would take for granted, such as the greeting between Bob and Lucius, the way each character sits down and the background movements of characters and environments, making this feel like a real world populated by real people. Jurassic World and Star Trek composer, Michael Giacchino, returns to continue his spectacular work from the first movie, which is arguably just as iconic as the film. The score here is brilliant, combining the usual superhero themes with 60’s era spy movies. It sounds different but similar to the first and elevates the film and on-screen antics beyond the average movie. It wouldn’t be fair to not mention the excellent short that precedes the film, with a story called Bao, about a Chinese-Canadian woman who gets a second shot at motherhood when one of her handmade dumplings comes to life. Directed by Domee Shi, it’s a strange but touching story that has no dialogue, but a fantastic score and some impressive visuals. It isn’t one of their best shorts, but it is certainly one of the better ones. Overall, Incredibles 2 is a fantastic follow-up that manages to make its mark in the populated superhero world we live in today. The characters are as fresh as ever and fully realised, with some spectacular action scenes that rival the original and a great message about our world that subverts expectations and worth delving into. Purple Revolver rating: 4.5/5. A truly incredible sequel.